Although our May 2nd event made it official, it’s not obvious why we call it Opening Day because the field never closes and we fly all winter. 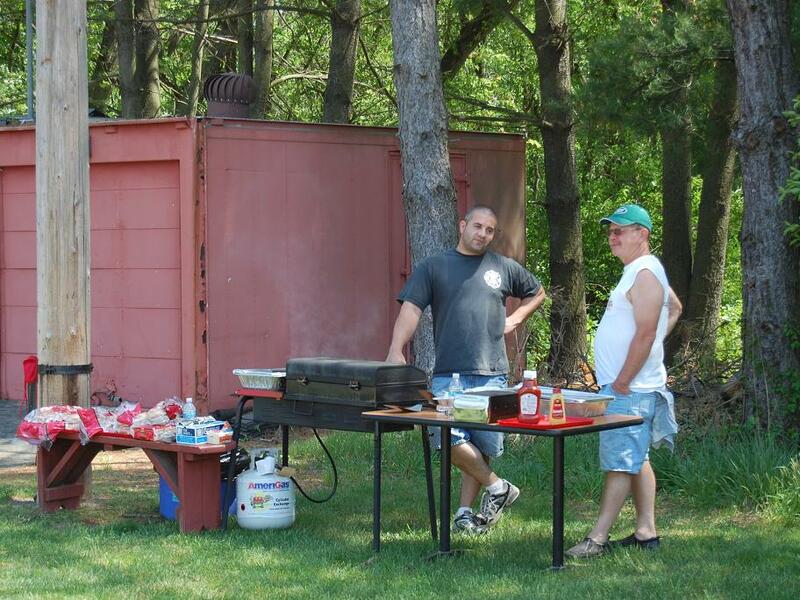 But it seems a good excuse for a picnic at the field and the club supplies hamburgers and hot dogs to the members. While the building contest accounted for much of the flying, there were plenty of other non-entry planes in the air with a large member turn out. By all accounts, the day was a great success and beautiful for flying. All of the Building Contest contestants flew this year and no one went home hungry! Bob Levanduski and Pat “Binky” Monacelli manned the grill! ... and Allan Schear presents the first bun. Bruce Evertson with his Nieuport 28 WWI Fighter. Jim VanBuren re-attaches an aileron on his Twist 150 after it malfunctioned mid- flight. Mike Busko fires up his Cap 232 designed with an Extra wing. Entries are lined up for the building contest. Relaxing in the shade. Bruce performs minor surgery after an unanticipated crosswind gust foiled a takeoff. Mark Hiestand’s Goldberg Yak, newly purchased from Gary “the unrelenting salesman” Sciarratta. Joe Raimondo and Frank Figurelli contemplate another flight. Grill masters Pat and Bob prepare to feed a hungry crowd. Nobu Iwasawa poses with his Fokker DR-1 WWI Tri-Plane. ...and follows up with a fly by.